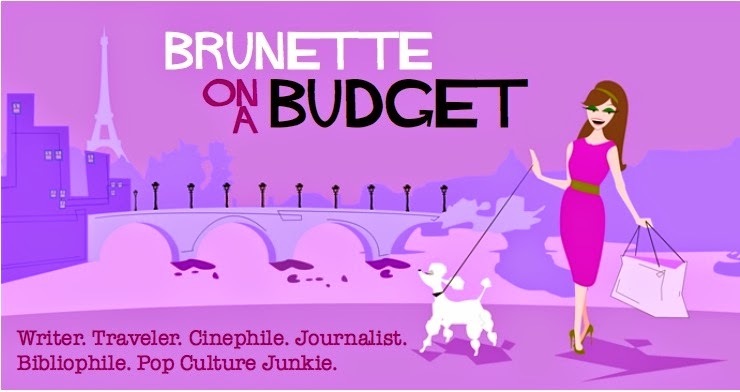 Brunette on a Budget: Book review: "Let the Great World Spin"
Lately I've become jaded with the whole NYC-as-the-stillpoint-of-the-turning-universe thing. I've heard just about every story that could be told about Manhattan and its outer boroughs, from Annie Hall to Taxi Driver and everything before, between, and after. I'm tired of reading about life in New York. That is, until I read Colum McCann's fantastic new novel, “Let the Great World Spin”. Before receiving my copy to participate in an online book tour, I researched critical ac claim for the text and tried not to roll my eyes. Another novel about what it means to be a New Yorker? Just what the world needs, I thought. And that was the mentality I went into reading the book with, which was foolish since after finishing my copy I can honestly say that “Let the Great World Spin” is one of the best novels I've read in a long time and deserves all the acclaim and accolades it has received (it won the 2009 National Book Award and was Amazon's “Best of the Month” pick in June of last year). It's August of 1974, when the Vietnam War is still simmering and tensions in the city are high. Real-life tightrope walker Philippe Petit decides to walk thousands of feet above Manhattan across a tightrope between the World Trade Center towers, and so he does after practicing for months at his country cabin and illegally rigging up a rope with friends. 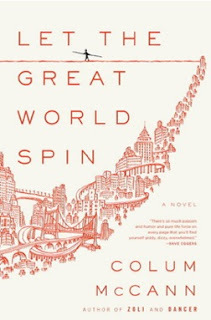 But McCann's novel doesn't focus on the factual Petit or his tightrope walking feat – it's about the native New Yorkers watching the spectacle above while their own lives tread more or less in chaos. The story begins far below the tight rope, on street corners in the crime-riddled Bronx and swanky apartments on the Upper East Side. McCann deftly weaves together a dozen or so different narratives – each chapter is from a different character's point of view – from New Yorkers of different ethnicities, religions and socioeconomic statuses. Each character is tethered to the next through tenuous, claustrophobic and often purely coincidental relationships based on occupation and social standing. The first chapter begins with two brothers, Corrigan and Cairan, raised by a single mother in Ireland. As fate would have it both brothers end up in New York as adults, first Corrigan and then Cairan, who travels across the Atlantic in search of his brother only to find him living in Bronx squalor—with heroin needles lining the street gutters and hookers hanging on every corner. Corrigan has come to New York in search of “a fully believable God, one you could find in the grime of everyday” and he finds it in the hookers he befriends and tries to help, buying them coffee and allowing them to use the bathroom in his dingy apartment. Only Cairan, as a newcomer, can see that his brother's attempts are futile, that Corrigan can not save any of these people, least not himself because he provides until he has nothing left to give emotionally, financially, or spiritually. From there McCann transports us to a tony apartment on Park Avenue, where the wife of a Manhattan judge sits nervously awaiting a group of ladies – a support group of sorts – who all share a common bond: Sons killed in the Vietnam War. Then the next chapter glides like a panning camera lens to two young artist newlyweds, children of privilege with simmering marital problems, smoking a joint as they race down the FDR and cause a horrific crash that changes the trajectory of a handful of characters in the book, including Cairan, the newcomer to New York City. Pages after there is another narrative, of the Park Avenue housewife's husband who became a judge to try and make the world, or at least New York, a better place only to realize during his first day in court faced with pimps and prostitutes that none of his rulings could ever clean up New York's streets. For me the most heartbreaking chapter was “This is the House that Horse Built,” where one of the hookers introduced earlier in the book gives a tragic first-hand account of how she fell into a life of prostitution and heroin, and how her daughter eventually followed suit. It was a painful reminder of how poverty and addiction can be gaping, cyclical holes that swallow people whole—people who are past the point of being saved. Wow, what a stellar review Crystal! Makes me want to read this novel. In fact, I feel like I have read some of it with your great descriptions. I started reading it but never finished. I got distracted. Maybe I should finish it this time! Amazing review!! I so want to read it now!! what a novel idea for a book. I would have never picked it up to read for myself but you make it sound so good! Couldn't agree more about the chapter about Tillie being the most affecting. I wanted to write a post JUST about that. Nice review - I think we agree on how brilliant this book is!